Acid reflux disease is a condition that results in inflammation to the oesophagus. This inflammation is caused by the presence of stomach acid in the oesophagus tube. The acid enters the tube because it travels up the throat from the stomach instead of travelling down the digestive tract to the small intestine. Because this acid is produced to break down food particles it is erosive in nature and can damage the tissue lining of the oesophagus upon contact. There are many factors that can lead to the development of acid reflux disease. The most common ones include consuming fatty foods caffeine, alcohol, chocolate, or spicy foods, smoking, pregnancy, obesity, and a slowed digestive process. The foods listed above can contribute to the onset of acid reflux disease because they are harder for the stomach digest and require the production of excessive acid. When too much acid is produced it is easier for the acid to slip up into the oesophagus during the digestive process. This is especially true if any of these food items is eaten in the course of a large meal. Adding excess food in the stomach to excess acid makes the trip up the oesophagus shorter. Smoking can contribute to acid reflux because the habit increased the production gastric juices, or stomach acid. When acids are produced and the stomach is empty of food particles the acids can travel up the digestive tract. Pregnancy and obesity both assist the stomach acid in reaching the oesophagus because the conditions put pressure on the abdomen and "push" the contents of the stomach upward. 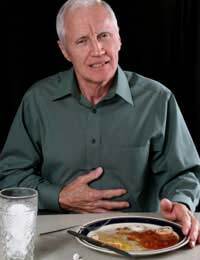 Finally, individuals with a slower digestive process run a greater risk of developing acid reflux disease. This is because the contents of the stomach sit longer and allow more opportunity for the acids to move upward through the digestive system. The symptoms of acid reflux disease include heartburn and chest pain. Both of these symptoms are caused by the action of the stomach acids on the lining of the oesophagus wall. Acid reflux disease can also cause regurgitation (where the food from the stomach rises up and re-enters the mouth), and difficulty with swallowing (because the acid irritates the lining of the throat). In extreme cases, usually after acid reflux has occurred for long periods of time, the stomach acids can make their way into the lungs, throat, or mouth and cause asthma, hoarseness, and tooth erosion. Acid reflux disease can become a serious condition if it is left untreated. Not only can it lead to other conditions as mentioned above, but also the constant pain associated with the disease can eventually interfere with daily life, activities, meals, and work. Treatment for acid reflux disease is easy to get and very effective. For mild or very periodic acid reflux over-the-counter antacids can be taken to neutralise the stomach acids and relive the pain associated with the symptoms. For more severe or frequent acid reflux symptoms prescription medications such as acid suppressants, prokinetic agents, and proton pump inhibitors are recommended. Acid suppressants reduce the amount of histamine in the stomach and block the excess production of stomach acid. Prokinetic agents relieve acid reflux symptoms by encouraging the emptying of the stomach. By increasing the speed of the digestive process the agents help the stomach avoid the condition of overfilling. Finally, proton pump inhibitors target the cells in the stomach that re responsible for acid production and work to reduce the amount of acid that gets released. Although the symptoms of acid reflux disease may only last for a short period of time the condition can worsen and become serious. If you suffer from heartburn or chest pain you should see a doctor about diagnosis and treatment.